This article originally appeared on Crosscut, and is reproduced here with permission. In a scenario repeating itself across the country, a Seattle church has offered refuge to an undocumented immigrant at risk of deportation. On June 28, Jose A. Robles, a 44-year-old husband and father of three girls, slept at Gethsemane Lutheran Church downtown. He found sanctuary on the same day he was supposed to board a plane headed for his home country of Mexico, a place he left 18 years ago. “He is safe here, and he is welcome here,” Gethsemane Pastor Joanne Engquist said to a crowd of supporters who attended a vigil at the church. She called deportation “an immoral action” that separates families. There is a long history of churches operating as safe houses. The Bible refers to churches as cities of refuge where those accused of murder could safely await trial. In the 19th century, churches hid runaway slaves. In the 1980s, hundreds of churches supported the so-called sanctuary movement in an attempt to save Central American refugees fleeing civil conflict from deportation. U.S. Immigration and Customs Enforcement generally avoids churches because they are considered “sensitive locations,” as are schools and hospitals. Gethsemane Lutheran, Engquist explained, voted to become a “sanctuary congregation” last April. Robles, who had been living in Lakewood with his family, co-owns a painting company with his brother Victor. He’s been fighting the deportation process for eight years, ever since he was caught driving with a suspended license. Jose Robles of Lakewood sits with his three daughters at a ceremony at Gethsemane Lutheran Church in Seattle. The church has offered him sanctuary from deportation to Mexico. June 28, 2018. In April, Robles and his brother were held at gunpoint and thrown into the bathroom of a barbershop that was robbed. Attorney Sandy Restrepo says Robles could now be eligible for a U visa — visas that are set aside for victims of crimes who have assisted law enforcement in an investigation — that would halt the deportation proceedings. So far, Lakewood city officials have declined to grant Robles the visa. City of Lakewood Communications Manager Brynn Grimley said state law prohibits her from speaking about Robles’ case. But she added the city had received 14 U visa applications this year. Of those, seven were certified by the City Attorney’s Office and granted; seven were denied. On Thursday, Robles had been feeling “all stressed out,” he said in Spanish. He arrived to Gethsemane with his wife and three daughters, two of whom are recipients of DACA, or Deferred Action for Childhood Arrivals: Brenda, 24, and Yuritzy, 19. Supporters have donated money to the Robles family. They said they would call Immigration and Customs Enforcement and Lakewood Assistant City Attorney Kimberly Cox to ask that Robles be allowed to remain in the U.S. In the meantime, Robles will remain at the church. “As long as I am somewhere family can visit, I’m fine,” Robles said, noting that there may be days when his wife and youngest daughter join him. He said he hoped to make himself useful, perhaps even by applying a fresh coat of paint on some of the church walls. “If they’re helping me, I can also lend a hand,” he said. Rev. Beth Chronister of University Unitarian Church said Robles has reason to hope. 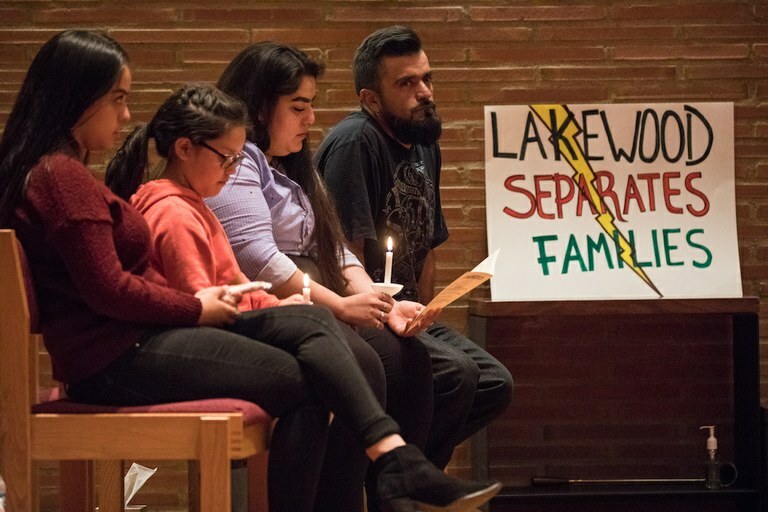 Chronister pointed to examples of undocumented immigrants who sought sanctuary in churches and were eventually allowed to stay in the U.S. Jeanette Vizguerra, for example, an undocumented mother of four who took sanctuary in a Denver church to avoid deportation, was granted a two-year stay in 2017.